After Göring was promoted to Reichsmarshall in 1940, he wore several unique Luftwaffe-pattern uniforms and rank insignias. Anyone of you got any ideas on how army-pattern Reichsmarschall insignias might have looked like, had they existed? We cannot choose the hour of our death. But we can choose what to do with the time we are given. What a great idea. Goering was chosen to be second only to Hitler, and he just happened to be the founder of the Luftwaffe, and hence his insignia and uniforms were based on the Luftwaffe designs. But I think Reichsmarschall transcended a particular service. The title roughly translates to "Marshal of the Empire" and this is clearly not a service branch designation. However, I personally like the idea of the red underlay with the gold cords and gold eagle-batons device. It would look really sharp. I hope someone with good art skills can post a drawing of this. The collar patches would be interesting too. Perhaps, the long trapezoidal generalfeldmarschall red patch with crossed gold Reichsmarschall batons and gold laurel leaves along edges of patch. This would then correspond with those actually used on the Luftwaffe pattern. I think the Great Admiral would continue to wear 4 cuff rings just like a general Admiral in charge of the Kreigsmarine would wear 4. *Luftwaffe Reichsmarschall-pattern shoulder boards with red underlay for army. *Army Reichsmarschall wears the ordinary collar patches for field marshals. *Army Reichsmarschall wears a generals peaked cap, with red cap band (similar to ww1 german generals), more elaborate oak leaf wreath (similar to DDR generals) and embroidered oak leaves on cap band. *Navy rank is called Reichsadmiral, wears blue underlay to shoulder boards. I was just wondering about the translation of the title reichsmarchall. In Icelandic it would be "Ríkismarskálkur" and then again in English the word "Ríki" means "State" put that word in front of marshall then you would have a State-marshall. Not a marshall of the empire as it was "reich" not an empire at least thats how I translate this. BTW i dont speak German but i understand some of it written not spoken. Olafur B Olafsson CEO and owner of Kaldi Security, Explosive specialist, and Rescue Team Member (ICESAR). Your wonderful drawings are fulfillment of the concept. Well done. 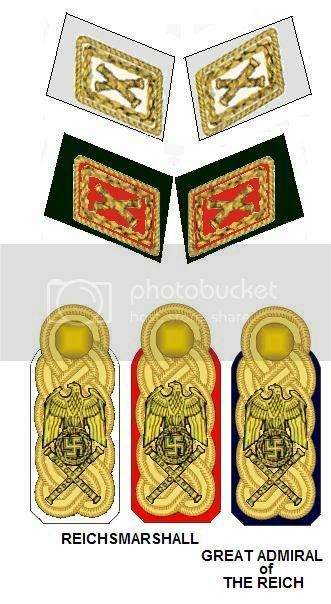 If Hitler had worn insignia, like the Kaiser, he probably would have worn the eagle-batons devices on boards with appropriately-colored underlays depending on which troops were being reviewed, etc. If Goering had succeeded Hitler, perhaps he would have done the same. I do speak German, and I can tell you that Reichsmarschall is a historic German title, first used in the Middle Ages (if memory serves). It was not used again until Goering in July, 1940, when Hitler elevated his successor and the founder of the Luftwaffe to a grade above even Field Marshal, making him a sort of 6-star general and at a level of grade equivalent only to Generalissimo of the Soviet Union held by Stalin. The word Reichsmarschall literally translates into Marshal of the Reich. Reich referred to the Greater German Empire, a term actually used by Hitler and I believe before him by Bismarck for the Second German Reich. The word Reich translates into English most closely as Empire. Another interpretation would be State or Realm. The context in which it is used determines its actual meaning. It is a geopolitical area in the sense of the Third Reich but can also mean Kingdom when it is used in a religious context. For example, das Reich Gottes, which means the Kingdom of God. These are the closest English equivalents of the German word Reich. Quite so. Remember, today every federal institutions is Bundes-something, like Bundeswehr, Bundespolizei, Bundesregierung, etc. The complete title would be obviously Defence (force) of the Federal Republic of Germany, but it's abbreviated to Federation's Defence (or police or gov't). So Reichsmarschall would be Marshall of the German Reich. indeed, Reich is state (kingdom is Konigreich, as in king's state, while empire is Kaiserthum) but I guess the Germans thought calling their country "state" rather than empire would be more adequate. And I think I can see the reason: kaisertum requires a kaiser, while reich can be construed as empire, but without an emperor (something like the Empire Francaise used after the fall of Napoleon III and used to encompass France and all her colonies - even de Gaulle used this term frequently and officially). All very interesting. I guess when one creates a government or controls it, it is difficult to find clear and simple terms to adequately express ones vision or authority in a way that everyone everywhere understands, especially when you want to control the world with so many diverse languages and cultures. Great work on those drawings, ryanemilia! Here's another question: what would the Army camo insignia and the Air Force flight suit insignia look like? Anyone have ideas? Ryanemilia has become DarthGaddafi and yeah I'll make some more Reichsmarschall insignia graphics. Also some better Kriegsmarine. I've been focused on Cold War stuff lately. BTW - I have gotten stuck on Zaire ranks of the 1970s, the post Belgian ones. I noticed on a Zairian general officer that he had a red slide with 3 or 4 yellow stars AND an additional device, but I cannot clearly see the device. I think it is some version of the tiger/panther head from the coat of arms, but it is hard to tell. I'll post the chart I have made, but I need to find better information regarding these 1970s insignia. Zaire might not have had the best regulations and generals, world-wide, are known for adding their own embellishments when they feel like it so there might be a range of insignia options at the time.